If you want to get to know the most interesting places of Barcelona and its coolest places, then this is your article! Here I’ll be talking about one of the most alternative quarters of the city. But, what is it that makes this quarter so different? As always, to explain this we have to go way back to its origin and, in this case, its very peculiar history, too. The quarter I am talking about is “El Raval”. Its name may ring a bell if you’ve already visited Barcelona before. Believe it or not, this quarter was born thanks to the plague, when the king Pere III ordered the construction of a new wall on the other side of la Rambla (a river by that time) to protect and close a new part of the city that was beginning to urbanize during the 14th century. 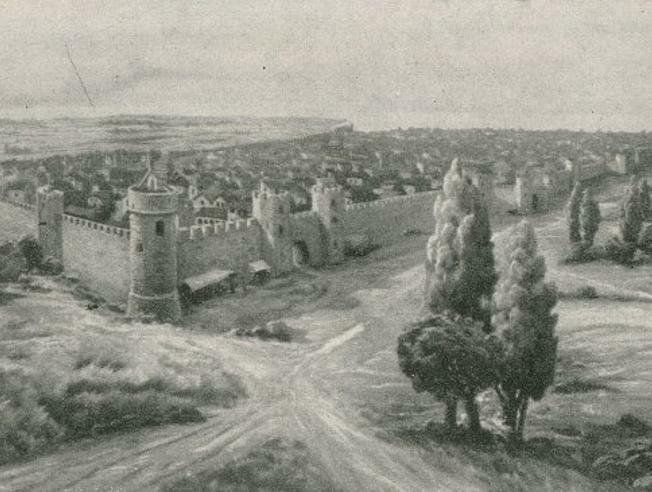 The king also wanted to create an area with a wide cultivation zone to have enough food to feed all the city in case of emergencies and locate the hospitals, orphanages and leprosariums out of the Gothic Quarter and the Ribera. In the 16th century, after the counter-reformation, the quarter became the chosen place to build convents and monasteries. However, these same religious institutions disappeared when the Spanish confiscation took place in the 19th century. This event made possible the construction of buildings like “La Boqueria” or the “Gran Teatre del Liceu” in the places where had been the previous convents and monasteries. Later, during the 19th century, a huge increase in the density of the population living inside of the quarter caused the beginning of the deterioration of the area. By the 20th century this deterioration settled and a certain area of the quarter gained a nickname: Chinatown. In addition, the proximity to the port, “La Rambla” and the encampment of Drassanes favored the concentration of brothels and other “no so legal” activities in the area. 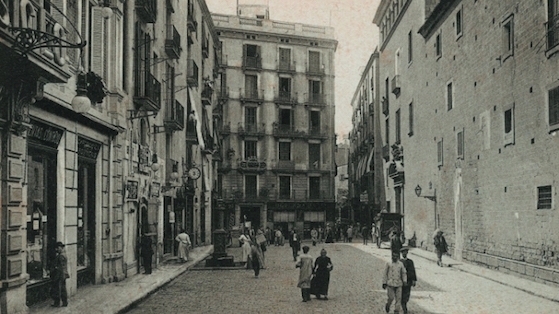 In this period the social reality of the quarter was marked by marginalization and poverty and throughout the Franco regime and the Spanish transition to democracy “El Raval” was considered one of the most dangerous places of Barcelona. But nowadays, the situation has changed thanks to all the social and urbanistic initiatives taken since the 80’s to change the quarter quarter for the best keeping its essence. Some of these include the creation more than 300 cultural equipment like theatres and museums. Well some of the most interesting things you can visit there are: the “Mercat de Sant Antoni”, “la Boqueria”, the MACBA (Museum of Contemporary Art of Barcelona), CCCB (Center of Contemporary Culture of Barcelona), the gardens of the old hospital “Santa Creu”, the “Palau Güell”, the fountain of “Santa Eulàlia” or “la Rambla del Raval”. Have you ever been in one of those places that makes you thrive with creativity? Makes you feel like you are in a completely different world? I consider Barcelona to be one of them. To me, and many people too, Barcelona is a place where inspiration can be found anywhere. This may be one of the reasons why artists have been visiting, living and appreciating the city during centuries. But those artists not only have been in Barcelona to get inspired but to inspire too. Thanks to that, one special place was built in the city. I bet you are wondering what I’m talking about, right? What is this place that touched the imagination of artists in the past and all types of people in the present? 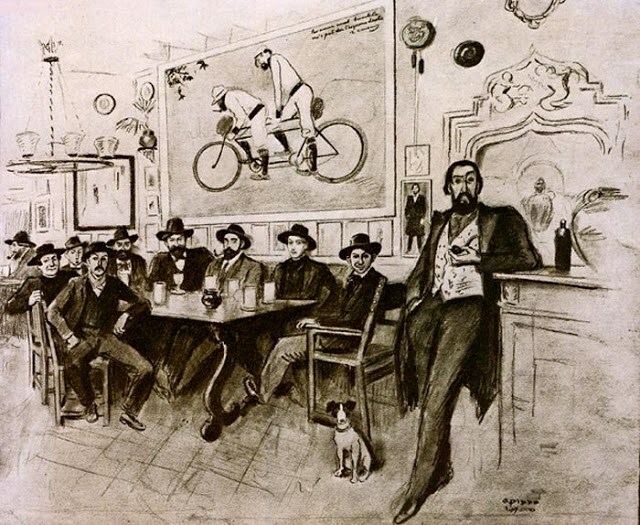 Well, the site i want to present you is nothing other than “Els 4 Gats”, a local café that was the second home of creative minds throughout the end of the 19th century and the first half of the 20th. 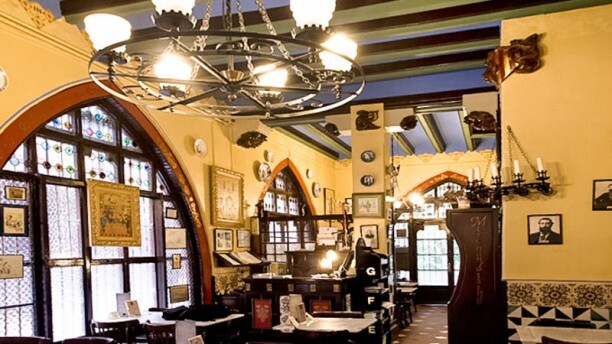 The history of this café starts during the 19th century with a monastery. 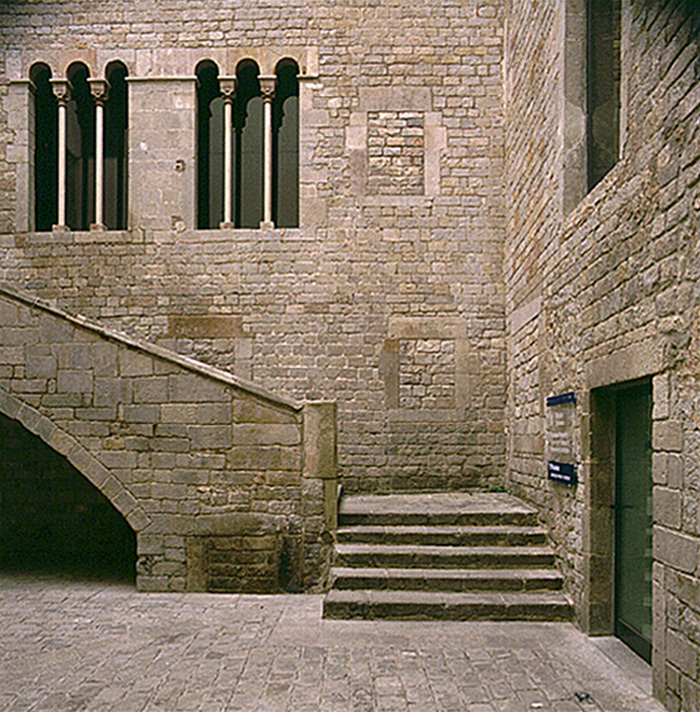 Yes, a monastery (Nostra Senyora de Montsió). One that was moved stone by stone to another site of the city leaving a big gap right in the center of the Barcelona. 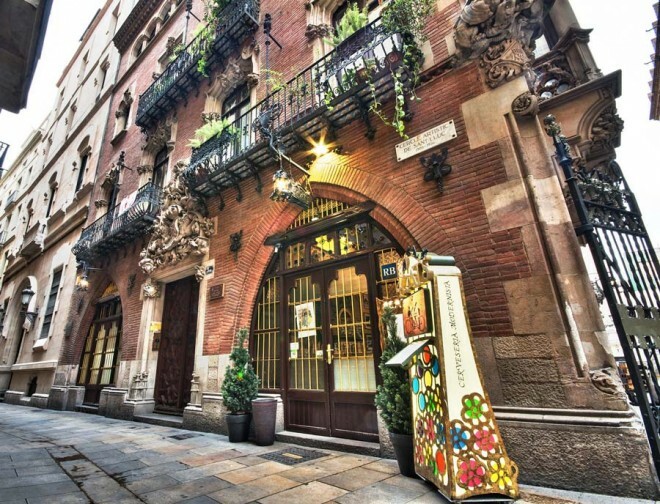 It was there where Mr. Martí decided to build an apartment building designed by Puig i Cadafalch, and called it “Casa Martí”. One year later, in 1897, its first floor would be occupied by “Els 4 Gats”. 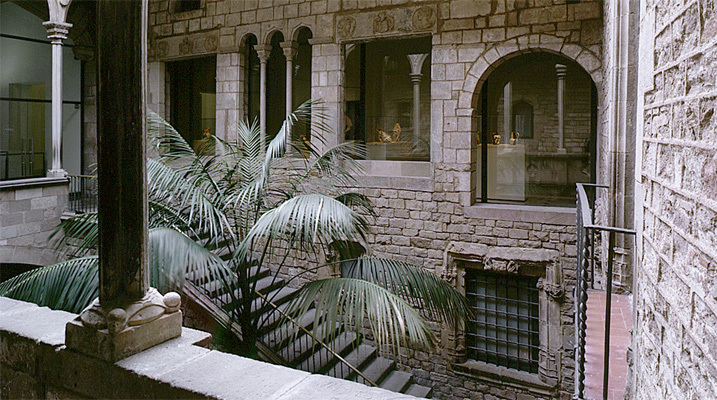 “Els 4 Gats” not only provided a place to exchange ideas, meet friends and be creative, but also helped young artists, like Picasso himself, start their careers. Thanks to that, the café is decorated with countless art pieces of both known and unknown artists. But, if its history, the building it’s built in or the art it holds is not enough to convince you, maybe the dishes it has to offer make the deal. “Els 4 Gats” offers breakfast, a weekly menu for 19 euros, and gastrobar, a variety of different tapas to choose. Isn’t it a good combination? What a better way to discover a new place than to learn about its history while you eat one of your favorite dishes? Great, right? If you’ve come to Barcelona and have visited the city, I’m sure one of the tours you’ve gone to had modernism as the main lure. Even if you decided to go and visit Barcelona all alone, I bet that the majority of monuments, places or attractions you’ve gone to are modernist. And now you may be wondering something like: how do you know? 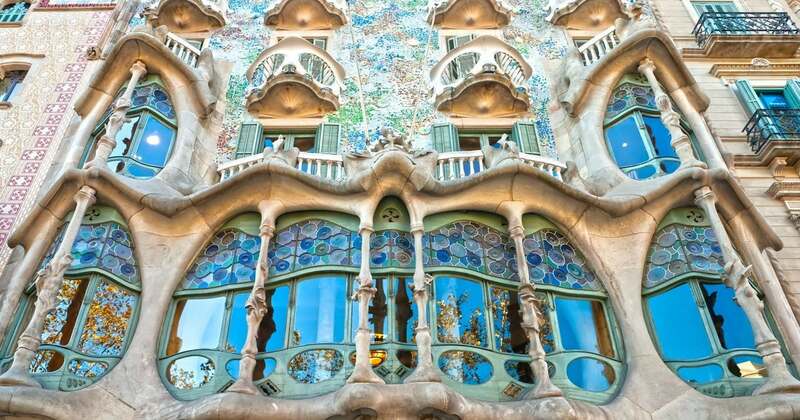 Well, it’s no secret that Barcelona has become the capital of this artistic and cultural movement. After all, the city is famous thanks to monuments such as “La Sagrada Família”, “La Pedrera” or “Park Güell”. But the thing is, what else do you visit when you have already visited the most well-known modernist buildings? I could go on and make a very long list of beautiful places built during modernism that for one reason or another aren’t as widely known as others, but instead, I’ll be giving you a little taste of one of this marvelous buildings. The one and only I’ve specially chosen to encourage you into visiting a different part of the modernist Barcelona is the “Hospital de la Santa Creu i Sant Pere”. But why? Why this particular place? What does it have that outshine all the others? 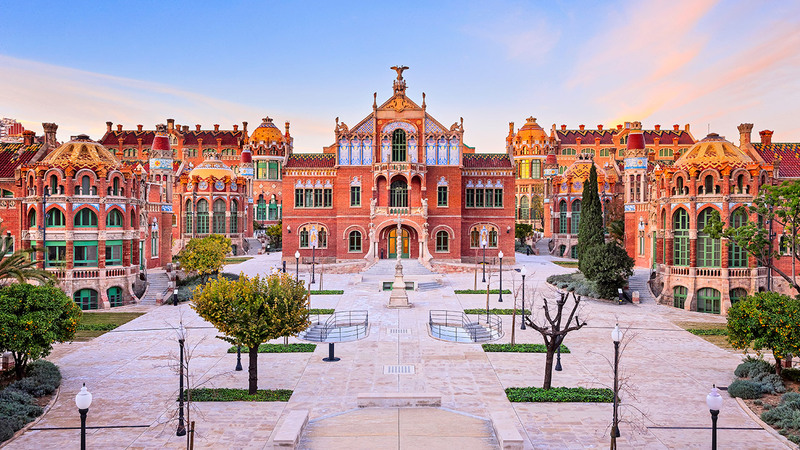 This hospital, commonly known as “Hospital de Sant Pau”, was designed by Lluís Domènech i Montaner, a Catalan architect mostly known for having designed “El Palau de la Música Catalana”, too. It was built at the beginning of the 20th century, specifically between 1902 and 1913, and enlarged in 1920 by Lluís Domènech son, Pere Domènech. Amongst all of the different buildings that form the construction, the main one is the most outstanding. On one hand, there is the façade. Its first floor is structured like an altarpiece with 3 streets and levels. In its lower level, there are three doors decorated with arcs with white and blue tiles and the initials of its patrons, those arcs supported by stone columns adorned with sculptures of angels. In the second level, there are big windows decorated with similar arcs, with a gothic style and stained glass. It also has an external ceremonial balcony. Finally, the third level, and the most interesting, have a sculptural ensemble formed by different elements: the coat of arms (with two winged characters representing Asclepius and Hippocrates), the saint protectors (Saint Josep, Saint Jaume, Saint Joan Baptista, Saint Teresa, Saint Anna and Santa Caterina de Siena) and the angels. Another important element of its exterior is the clock tower, located on top of the building. On the other hand, the inside of the building has a monumental appearance and a labyrinthine style. Its floor is constructed in a pointed cross (symbol of the hospital) and the decorations of floors and walls simple. However, in comparison, the vaults of the ceiling were heavily ornamented. I have no doubt that now you’ve seen a little bit of this amazing building and have learned something about it, you want to visit it. And you know what would be even greater? Explore that unknown modernist Barcelona I was talking about! As you may know, Barcelona is a city with a lot of history. But have you ever wondered what made the city grow how it did? Even though it has had a lot of ups and downs, today we’ll be talking about one of the greatest eras for Barcelona’s growth. Can you tell what that era was? If you haven’t figured it out yet, I was referring to the Industrial Revolution of the city. Now, you’ll probably want to know how it did start, am I right? It all began in the 18th century when the city became one of the main manufacturing cities of Europe thanks to its tradition as an important commercial and handmade objects center of the Mediterranean area, and the integrations of Barcelona in the international trade due to the exportation of liquor and the manufacture of indianas. Indianas are cotton printed fabrics that revolutionized the world of the traditional textile industry modifying the way fabric was consumed and fabricated. Indianas became a product of massive consumption changing how people dressed and decorated their houses. This way, this type of fabric was created following capitalistic principles, a method of organizing work and production that presented characteristics of modern factories. 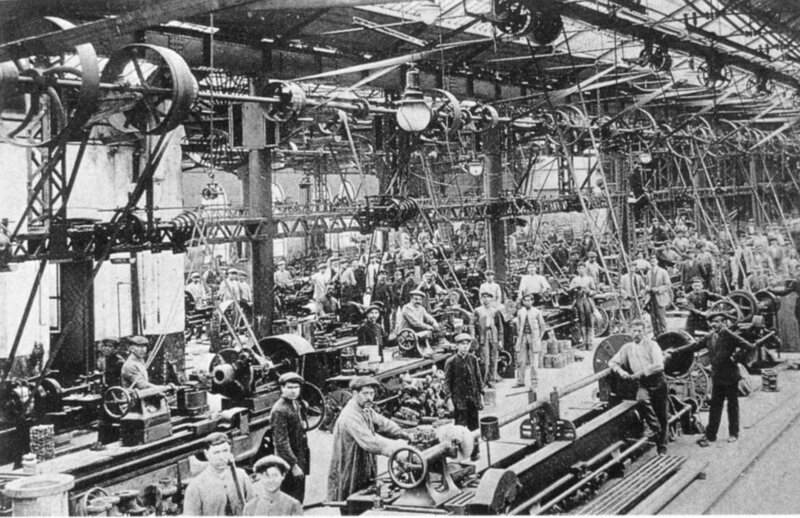 The development of indianas manufactures during the second half of the 18th century made possible the conditions to begin the process of industrial modernization in the first decades of the 19th century. 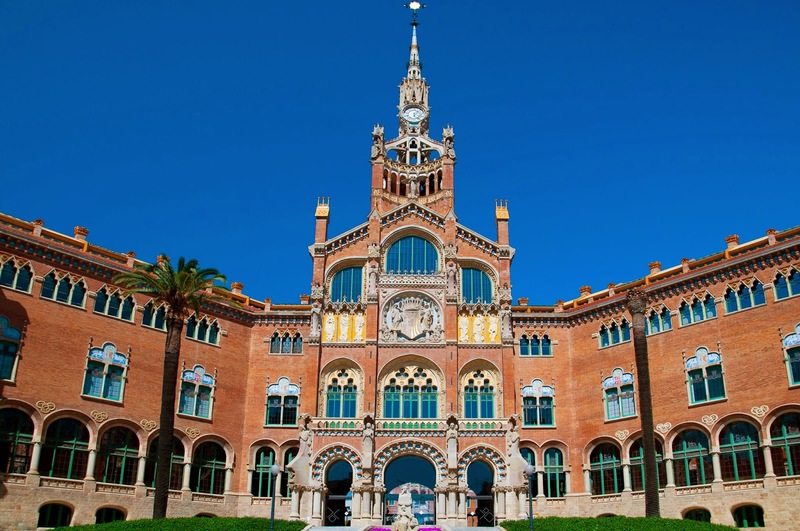 The technical and organizational changes made in the course of difficult times marked for wars and revolutions were decisive to start the industrialization process that turned Barcelona into an important industrial center in Europe. In addition, the factories contributed actively in the organization of the public space of Barcelona. Plus their increase caused the birth of manufacturing districts inside the walls of the city and generated the first debates about the model of the city. 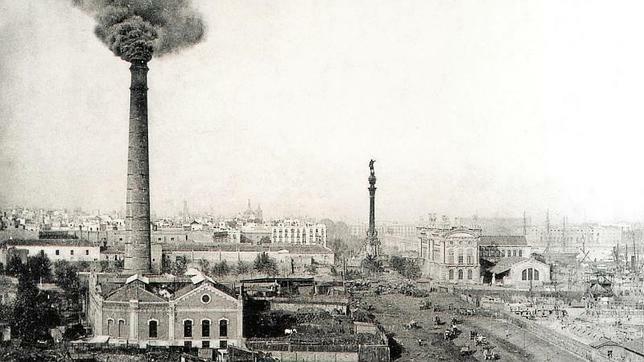 The saturation brought by the industrialization during the second half of the 19th century forced Barcelona to expand outside of the walls. This was how Barcelona grew during the Industrial Revolution. I bet now you know that part of the history of this incredible city you’d also like to visit some of the places that marked the era. It would be a unique way to explore Barcelona don’t you think? 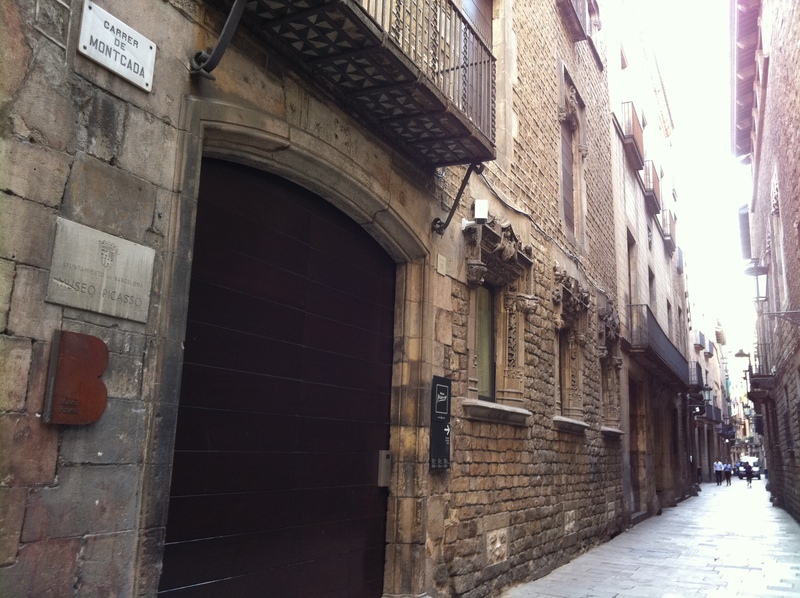 If you like medieval architecture and happen to be in Barcelona, there is a street you can’t miss visiting. This street is known for its palaces, marvelous constructions built right in the Middle Ages. You may be wondering things like: What is this street called? What kind of history has? Which are those incredible palaces? 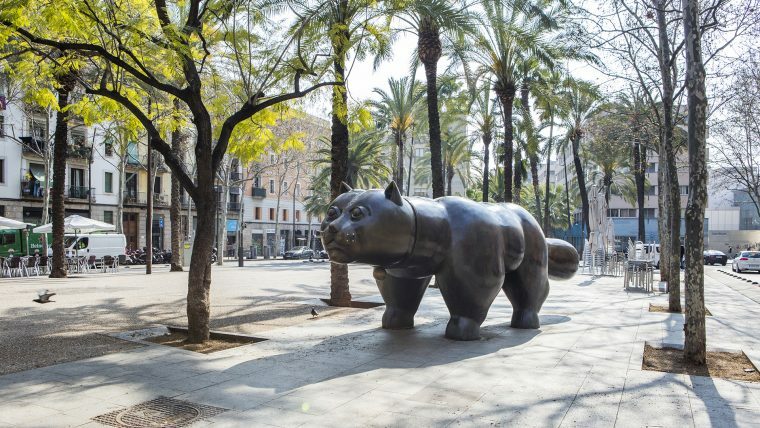 To answer to the first question, its name is Carrer Moncada and its history begins in the 12th century when a very important family of Barcelona received lands in the city as gratitude present after showing their support towards the king Ramon Berenguer IV with the conquest of Mallorca. 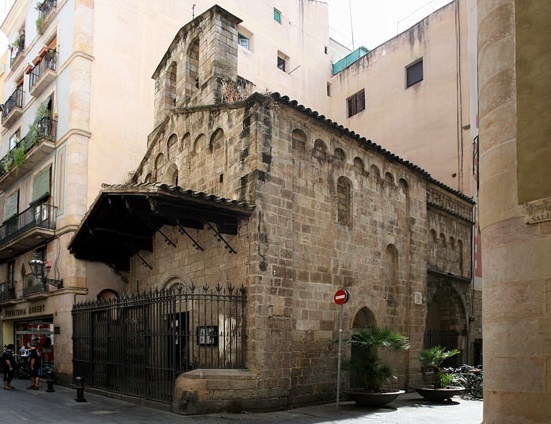 Nowadays, the street starts at the Romanesque Marcus chapel and finishes at Plaça del Born. But when it was created, during the 12th century after the first houses outside the wall were constructed, it linked the Bòria commercial district with Vilanova del Mar old sailing quarter forming the Ribera district. 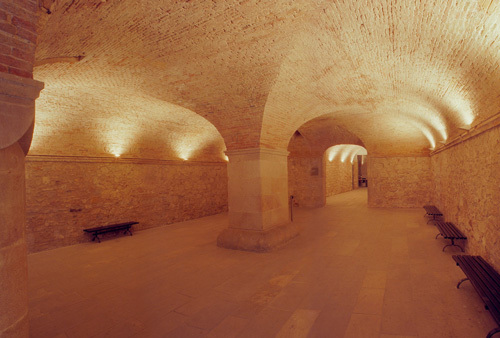 By the end of 12th century, it was incorporated inside of the new city walls, experiencing its best time between the 15th and the 16th century when the Carrer Montcada was inhabited by rich merchants and noble families and became the center of the aristocracy of Barcelona. At the end of the 19th century, it stopped being one single street when it was divided by the opening of Carrer Princesa and at the start of the 20th century, it was declared an artistic-historical heritage site. 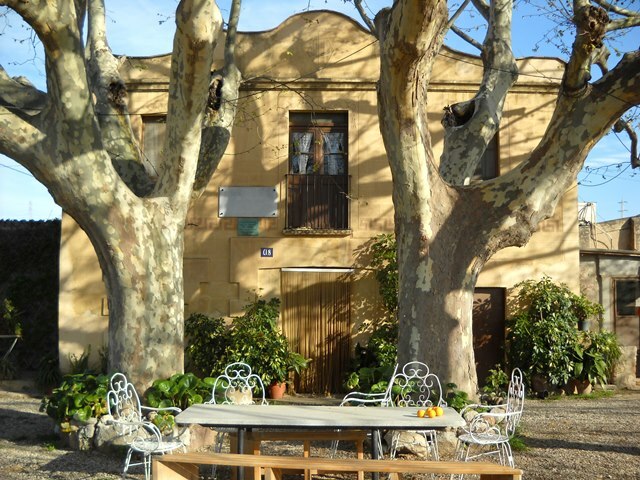 Now that you know the origin of the Carrer Montcada and some of its history, it’s time to reveal a few of its palaces. The first one we’ll be talking about is Palau Aguilar. This palace was built in the 13th century and had several renovations between the 15th and 18th centuries. The Palau Aguilar was renovated by continuous generations of the Aguilar family, causing the palace to have a lot of different styles in it. Inside of it, you can find sculptures, a pointed arch gallery and a central courtyard with an open-air stairway from the 15th century. There is also a coffered ceiling on the first floor and a mural from the 13th century. Then, there is the Palau del Baró de Castellet. Even though the palace is originally medieval, it went under an important renovation during the 18th century. It has a central medieval courtyard, its facade still preserves a 16th-century religious motif and it has a neo-classical room on the main floor with polychrome motifs and marble elements. 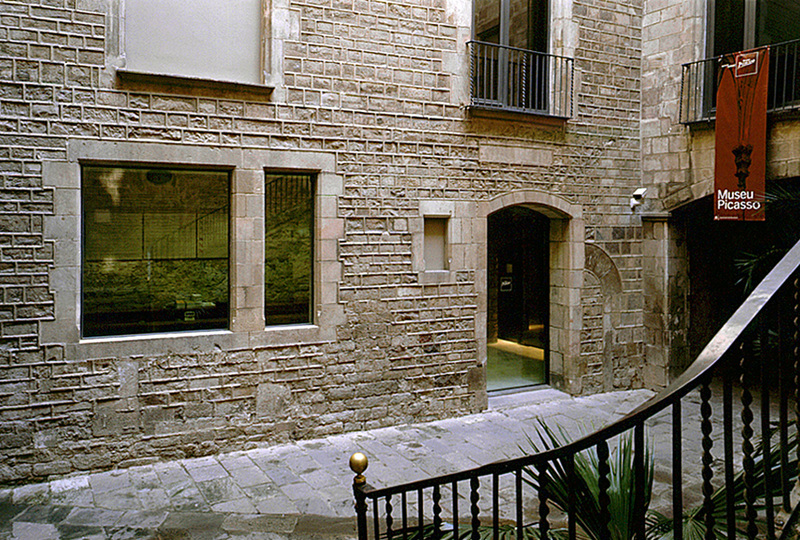 There is also the Palau Meca, constructed between the 13th and the 14th centuries and remodeled in the 18th century. It has a central medieval courtyard with coffered polychrome medieval ceilings and 19th-century decorative ceilings on the main floor. On the other hand, Casa Mauri it’s a construction from the 18th century. The palace has a courtyard in part built over Roman era remainders that belonged to one of the towns near the original Barcino colony. Its façade has a small wooden truss, typical of the 18th century and one of the lasts in the city. 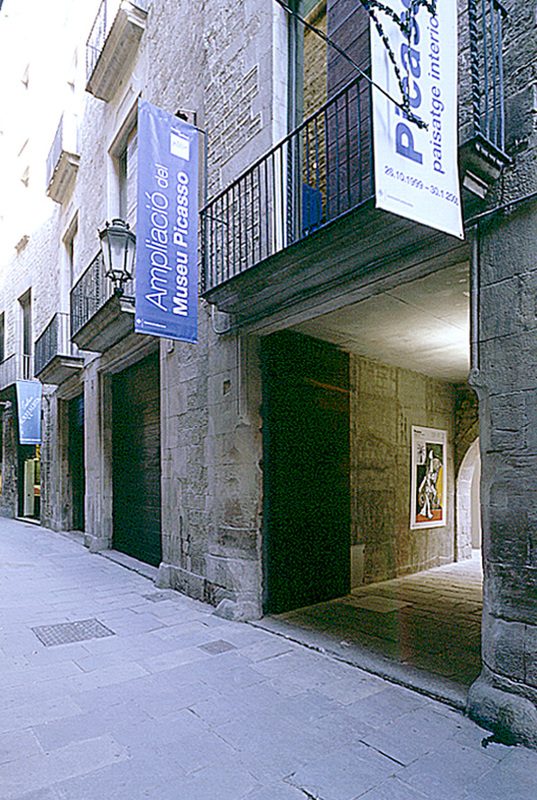 In addition, the building was renovated during the 19th century when it was connected to the Palau Finestres. Finally, the Palau Finestres was built in the 13th century on top of the remains of a Roman necropolis. It has a large courtyard with an outdoor stairway that leads to the main floor. In the first floor, two triple windows with columns can be found. This floor also has a restored coffered ceiling from the 13th-14th centuries. The palace was reformed in the 15th and 17th-18th centuries when the round arch gallery crowning the inner courtyard was added. I bet that now you know some of the most interesting characteristics of these palaces you want to visit them and see all of it by yourself. But, what if I tell you that their architecture is not the only thing you’ll be able to enjoy in them? These buildings form the actual Museu Picasso. So if you aren’t just an enthusiast of medieval history and architecture but you like art too, then it is the perfect place for you! 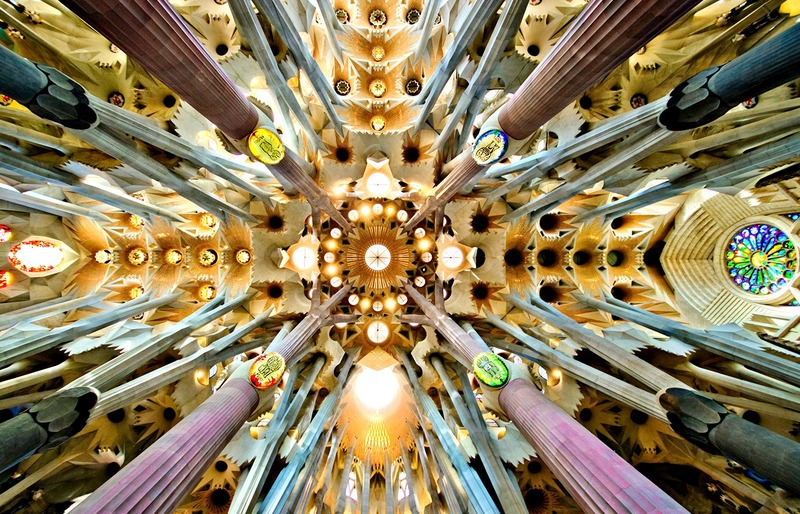 Have you ever wondered what was in Gaudí’s mind when he decided to create art the way he did? 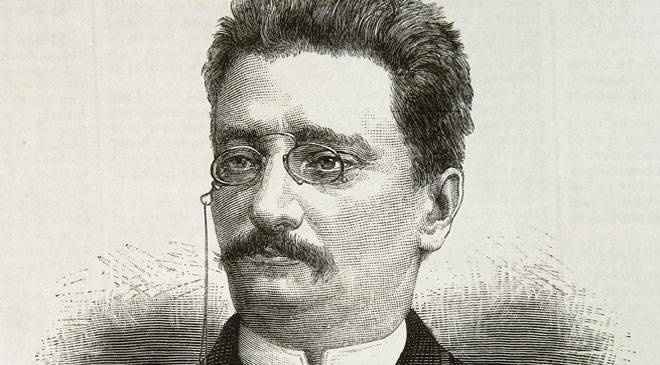 What was he thinking when he designed monuments like “La Sagrada Família” or “La Pedrera”? Truth to be told, Gaudí was, for sure, one of a kind. An incredible artist who found a unique way to express how he envisioned the world. And one of the questions I ask myself when I think about this is: What is it that makes his work as beautiful as it is? Before answering all of that questions, first, we have to understand how Antoni Gaudí was as a person. To do that we’ll go back in time to see a little bit of his life, the things that marked him through it, his beliefs and what made him the way he was. Gaudí was born the 25th of June of 1852 in Reus or Riudoms (it’s not known for sure which of these two Catalan towns watched the artist be born). As a child, Gaudí suffered from poor health, which contributed to his timid and reserved character. Because of this, he had to spend a lot of time in a country house in Riudoms (Mas de la Calderera), where he built interest in nature and animals. Besides that, thanks to the work he did as a boilermaker in his family’s repair shop, he started to get the knowledge necessary to work with volume. On another hand, as a young adult, he studied architecture in Barcelona while working in architecture studios to pay for his studies, in which he already started to show signs of brilliance, and even got to work with some of his professors. After he received his degree, he established his own study and met Eusebi Güell, who ended up being, not only a good friend but an important driving force in Gaudí’s art. That way, we can tell that some of the experiences he lived during his life made an impact in the way he designed buildings and did his art. As you have read, the presence of nature for longs periods of time in his childhood is one of them. After all, Gaudí found sense in the essence of nature itself, following its patterns and respecting its laws. He wanted to cooperate with it to make his architecture as beautiful and sustainable as possible and believed that a way to be original is to return to the origin. Another one is the time Gaudí spent at his family’s repair shop where he learned to conceive space and the transformation of materials. Now that you know a little better where Gaudí’s inspiration comes from I’m sure you’ll want to see the wonderful things he made thanks to it. Some of the places and monuments you can visit in Barcelona are “Casa Batlló”, “La Pedrera”, “La Sagrada Família” or “El Parc Güell”. It would be great to see these masterpieces in person, right? Barcelona is one of the most well-known cities in the world. It receives millions of visitors a year thanks to its famous monuments and attractions, some of them as old as the city itself. Have you ever thought about how old Barcelona actually is? This question brought me to search about the origin of the city, and it wasn’t the historical version that drew me in, but the mythological one. You may be wondering what kind of mythological origin it is. Does it have gods? Adventures? Heroes? The answer to all of those questions is yes. It has all of that and more. After all, Barcelona was created by a demigod. Yes, you read it right. A demigod. To be more precise, a roman one. Can you guess who could it be? In case you haven’t guessed, the one I am talking about is Hercules, son of the god Jupiter and the mortal Alcmena. His name probably rings a bell. All in all, Hercules is the protagonist of a good number of Roman legends and myths. But, which one of these myths explains the birth of Barcelona? Believe it or not, this legend begins at the moment Hercules went mad and killed his sons. As a punishment, he had to serve the king Eristeo for 12 years and do one particular task for him each year. 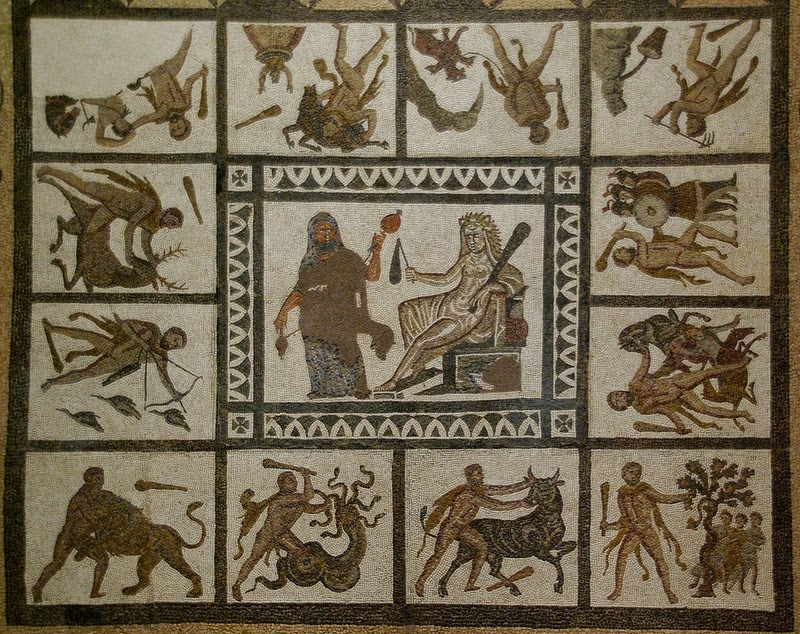 Out of all of the tasks Hercules had to do, the 10th was the one that unintentionally caused the creation of Barcelona. This specific mission consisted in stealing the flock of cows and bulls from the giant Gerion and bring it to Eristeo. When he arrived at Heriteia (the present-day city of Cadiz) to accomplish this task, he had to fight against Gerion to get his flock. To do it, Hercules transformed into a giant and fought on top of the whole Iberian Peninsula, using the entire land as a massive ring. 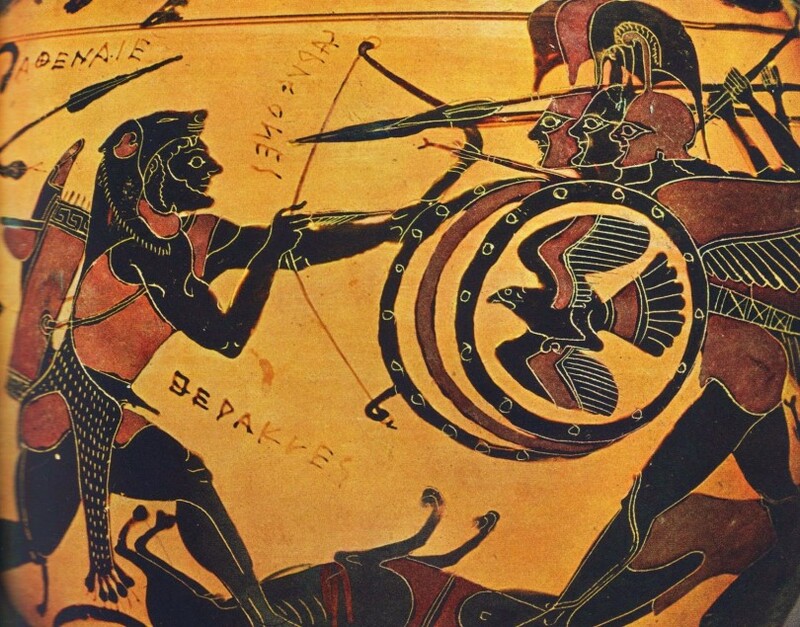 After a week of fighting Hercules killed Gerion, winning the battle. How is this great adventure related to the birth of Barcelona? Well, the thing that connects the creation of Barcelona with this legend is Hercules procrastination, considering that instead of bringing the flock of cows to Eritreo right after the fight ended, he decided to take a little rest and lie for a while. It was later, when he stood up, that he realized in what of a gorgeous place he had been resting. Hercules was so captivated by its beauty that decided to create Barcelona right there. It is a pretty good story, isn’t it? In my opinion, for a city to have a legend like that it’s very cool. It makes me want to investigate more about it. What about you? Wouldn’t it be great to find about the many myths of Barcelona in person? Will there be a sculpture of Hercules hiding somewhere? Or will you find others demigods in the streets of Barcelona? Could you imagine a 13-year-old girl fighting for her right to believe in whatever she wants? Defending her freedom of choosing a religion, and doing it not just for herself, but for the citizens of the city where she lives, too? If you think about it, it’s something not everybody would be brave enough to do. But, here in Barcelona, we’ve got someone like that, or at least that’s what the legend says. The person who I am talking about is Saint Eulàlia, the little girl who got to be the patron saint of the city thanks to her courage and bravery. Her story begins way back in time when Barcelona was called Barcino and the Roman Empire was at its peak. Saint Eulàlia, born in Hispania during the 290 a.C., was originally from Desert del Sarrià, situated in Pla de Barcelona, and belonged to a well-off Christian family at a time which Christianity was persecuted and punished by the Roman Empire. When she reached 13 years old, Saint Eulàlia ran away from home to appear in front of the authorities to show her opposition to the law and protest against the persecution of Christian believers. The governor, infuriated with her behavior and the fact that she wouldn’t refuse to her faith, sentenced her to die after suffering 13 different types of tortures. As many as her age. You may not believe me, but after the tragic events that happened in her life just for wanting to have a right everybody should be able to have, it wasn’t until 633, that she was canonized and became the saint patron of Barcelona. After reading this legend and realizing why this girl turned in to be the patron of the city, you may be wondering if there’s any place you could visit related in some kind of way to the Saint, right? Well, there is a place in the city that could be of your interest. That place is the Catedral de la Santa Creu i Santa Eulàlia, the cathedral of Barcelona. 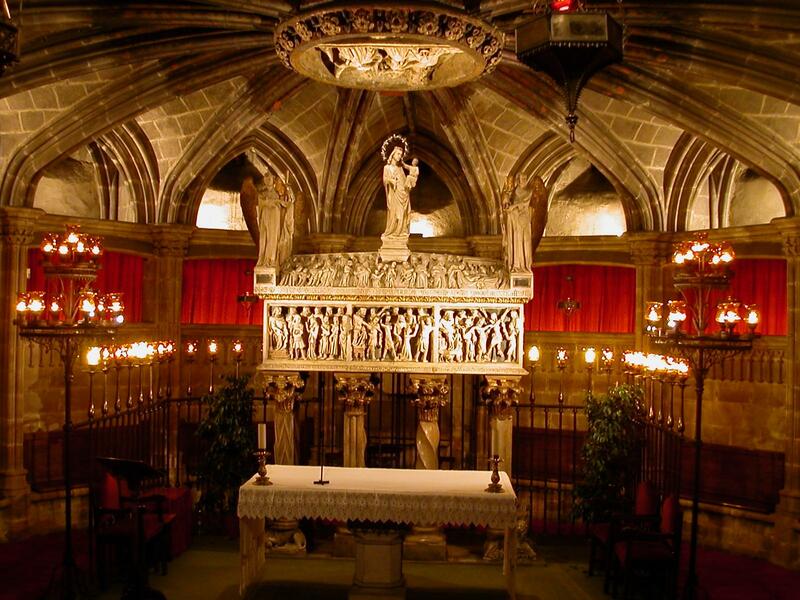 There you can find the Crypt of Saint Eulàlia, situated under the high altar of the temple, where the remains of the Saint were moved in 1339 from the Basílica de Santa Maria del Mar to the cathedral. In this rare gothic crypt, the remains of Saint Eulàlia lie in the sarcophagus of alabaster, made out of said stone, carved by the Italian sculptor Pisa Lupo di Francesco and decorated with different stages of Saint Eulàlia’s life, four angels and the Mother of God with baby Jesus. 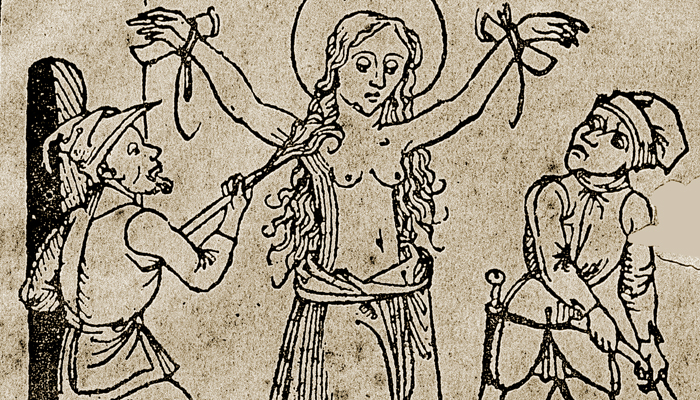 What are your thoughts about Saint Eulàlia’s story? Could you imagine yourself doing something like what she did? I am sure, now that you already know some of her story you are more even more curious! I mean, who wouldn’t be? “Sónar” is a three-day electronic music festival which got founded 1994 in Barcelona. The festival is divided into two parts: “Sónar by Day” and “Sónar by Night”, with Sónar+D, which is a three-day congress about Creativity, Technology and Business. The El Born district is one of the districts nearby Las Ramblas. This trendy barrio hosts the 3rd edition of the “Born Street Food” on the 15th to 17th july. 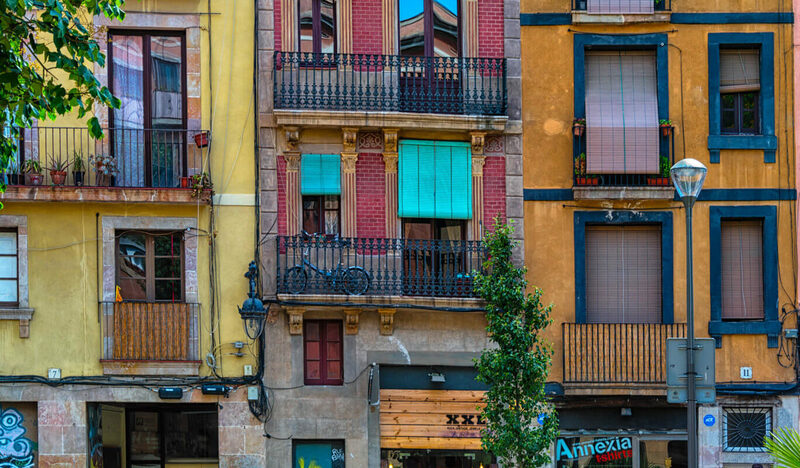 It is a gastronomic project of the cooks, stores and restaurants of EL Born, that united to present the high-quality gastronomy, which you can find in this historic district. 14 different cooks are invited to show their best food at the Plaza Pla de Palau, where the event is going to occur.